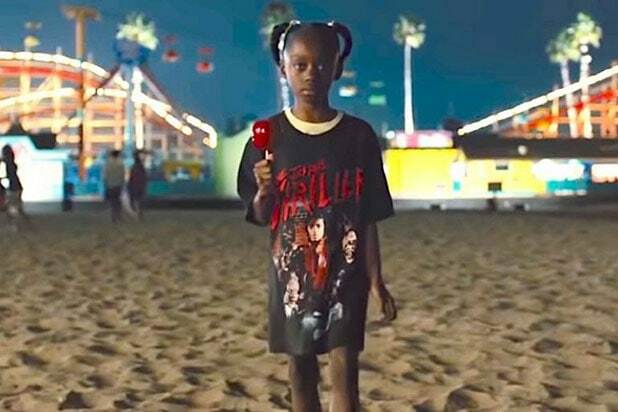 Jordan Peele’s “Us” is chock full of references to Michael Jackson, starting when Lupita Nyongo’s younger self wins a “Thriller” t-shirt at the Santa Cruz boardwalk in the 1980s. But Peele and his costume designer Kym Barrett threw several more nods to the late King of Pop, who is back in the news given the documentary “Leaving Neverland,” in which two men accuse Jackson of sexual abuse (accusations that his estate has disputed). The doppelgängers in the film, or The Tethered, wear red jumpsuits and one single glove — just as Jackson wore a red outfit during his famed 1983 music video “Thriller,” and Jackson’s single white glove covered in silver sequins made its TV debut during his performance of “Billy Jean” at Motown’s 25th anniversary in 1983. The single glove would become a signature style throughout the rest of his career. “There are a lot of references running throughout the movie and there’s a lot of nodding and homages to different directors and different horror movies,” Barrett told TheWrap. “The leader of The Tethered has had access to that T-shirt and she knows who Michael Jackson is. She’s seen imagery and she’s seen like the Hands Across America T-shirt, there’s a lot of imagery which she’s seen. The “Thriller” T-shirt, of course, also correlates to the underground world where the Tethered walk around in a zombie-like fashion — similar to how Jackson and his dancers behaved in director John Landis’ video. The idea for the doppelgängers’ jumpsuits originally came from utilitarian wear, “work clothes that people go out to work out every day and things that people who construct the infrastructure of society wear,” Barrett said. She also wanted to set the doppelgängers apart from the above-ground family of Lupita Nyong’o and Winston Duke’s characters. “They were lights in the darkness because they go through such an extended kind of horrific set of events but they are always coming back together,” she said.